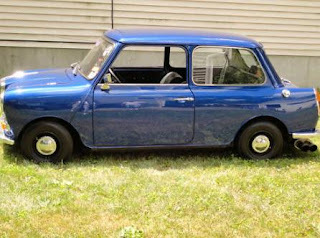 Just A Car Geek: 1968 Riley Elf - Ask Questions. Ask A Lot Of Questions. 1968 Riley Elf - Ask Questions. Ask A Lot Of Questions. I have a lot of questions about this car, but it's interesting so I thought I'd point it out. This is a Riley Elf. 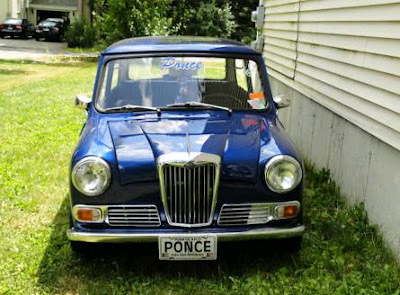 It was built to be a "luxury" Mini. Upfront there is a formal, upright grille. In the back there is an actual trunk. Everything else is pure Mini. The Elf was never officially imported into the US and that's what makes this car interesting... It's LHD. I've seen a few Rileys at shows, but they've always been RHD. This ad is a bit confusing. 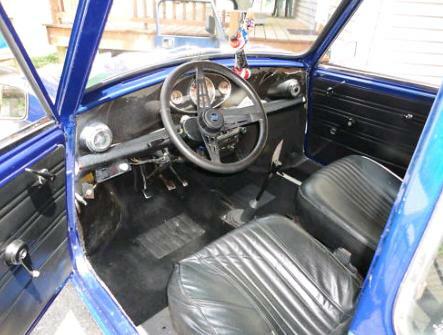 In the ad's title, the seller writes "1st Mini ever made from UK". Huh? I have no idea what that means. The car has new paint (it lost its distinctive white roof in the process) and what appears to be a rebuilt (or at least painted) engine. All-in-all, this is an interesting car that you would need to check out very, very carefully before purchasing it. Located in Trumball, CT, click here to see the eBay listing.